This article is about the American science educator. For the British actor, see Bill Nighy. For other people, see Bill Nye (disambiguation). William Sanford Nye (born November 27, 1955), popularly known as Bill Nye the Science Guy, is an American science communicator, television presenter, and mechanical engineer. He is best known as the host of the PBS and syndicated children's science show Bill Nye the Science Guy (1993–1998), the Netflix show Bill Nye Saves the World (2017–present), and for his many subsequent appearances in popular media as a science educator. Nye began his career as a mechanical engineer for Boeing Corporation in Seattle, where he invented a hydraulic resonance suppressor tube used on 747 airplanes. In 1986, Nye left Boeing to pursue comedy, writing and performing jokes and bits for the local sketch television show Almost Live!, where he would regularly conduct wacky science experiments. Nye aspired to become the next Mr. Wizard and with the help of several producers successfully pitched the children's television program Bill Nye the Science Guy to KCTS-TV, channel 9, Seattle's public television station. The show—which proudly proclaimed in its theme song that "science rules! "—ran from 1993 to 1998 in national TV syndication. Known for its "high-energy presentation and MTV-paced segments," the program became a hit for both kids and adults. The show was critically acclaimed and was nominated for 23 Emmy Awards, winning nineteen. Nye was born on November 27, 1955, in Washington, D.C., to Jacqueline Jenkins-Nye (née Jenkins; 1921–2000), who was a codebreaker during World War II, and Edwin Darby "Ned" Nye (1917–1997), who also served in World War II and worked as a contractor building an airstrip on Wake Island. Ned was captured and spent four years in a Japanese prisoner-of-war camp; living without electricity or watches, he learned how to tell time using the shadow of a shovel handle, spurring his passion for sundials. Jenkins-Nye was among a small elite group of young women known as "Goucher girls" whom the Navy had enlisted to help crack the codes that were used by the Japanese and German military. "She wasn't Rosie the Riveter, she was Rosie the Top-Secret Code Breaker," Nye recalls. "People would ask her what she did during World War II and she'd say, 'I can't talk about it, ha ha ha!'" Nye attended Lafayette Elementary School and Alice Deal Junior High before attending Sidwell Friends for high school on a scholarship in 1973. Nye moved to Ithaca, New York to attend Cornell University and study at the Sibley School of Mechanical and Aerospace Engineering. His enthusiasm for science was deepened after taking an astronomy class with Carl Sagan. He graduated with a BS in mechanical engineering in 1977. After graduating from Cornell, Nye worked as an engineer for the Boeing Corporation and Sundstrand Data Control near Seattle. While at Boeing, he invented a hydraulic resonance suppressor tube used on Boeing 747 airplanes. Nye applied four times for NASA's astronaut training program, but was always rejected. Nye started doing standup comedy after winning a Steve Martin look-alike contest in 1978. Nye's friends began asking him to do Steve Martin impressions at parties and he discovered how much he loved to make people laugh. Nye began moonlighting as a comedian, while still holding his day job as a mechanical engineer at Boeing. Nye has stated of that time: "At this point in our story, I was working on business jet navigation systems, laser gyroscope systems during the day, and I'd take a nap and go do stand-up comedy by night". He also participated in Big Brothers Big Sisters of America and would volunteer at the Pacific Science Center on weekends, as a "Science Explainer". 1986–1991: Comedy beginnings and Almost Live! Nye quit his job at Boeing on October 3, 1986 to focus on his burgeoning comedy career. During Nye's 10 year college reunion in 1987, he went through great lengths to meet with Sagan at Cornell. His assistant told Nye, "Okay, you can talk to him for five minutes." While meeting him at the space sciences building, Nye explained that he was interested in developing a science television program. "I mentioned how I planned to talk about bridges and bicycles and so on—stuff that, as an engineer, I'd been interested in—and he said, 'Focus on pure science. Kids resonate to pure science rather than technology.' And that turned out to be great advice." In 1986, Nye worked as a writer/actor on a local sketch comedy television show in Seattle, called Almost Live!. Nye first got his big break on the show from John Keister who met him during an open mic night. After a guest canceled, co-host Ross Shafer mentioned to Nye that he had seven minutes of programming to fill. "Why don't you do that science stuff?" Shafer suggested. On the show, Nye entertained audiences with comical demonstrations like what happens when you eat a marshmallow that's been dunked in liquid nitrogen. His other main recurring role on Almost Live! was as Speed Walker, a speedwalking Seattle superhero "who fights crime while maintaining strict adherence to the regulations of the international speed-walking association." One famous incident on the show led to his stage name. He corrected Keister on his pronunciation of the word "gigawatt", and the nickname was born when Keister responded, "Who do you think you are—Bill Nye the Science Guy?" Nye's science experiments strongly resonated with viewers and the local chapter of the National Academy of Television Arts and Sciences awarded Nye a talent Emmy for one of his segments. Even though Nye had become a regular on Almost Live!, he was only doing freelance work for the program. While looking for more TV gigs, Nye was given the opportunity in 1989 to host a short educational program on Washington State's wetlands called Fabulous Wetlands, sponsored by the Washington State Department of Ecology. On Fabulous Wetlands, Nye explained the importance of preserving estuaries and the hazards of pollution. The show became, in many ways, a model for Nye's later show, with "zany camera cuts paired with Nye's humor" that set it apart from the typical scientific broadcast. Nye soon began getting more offers to make appearances on nationally broadcast programs, including taping eight segments for the Disney Channel's All-New Mickey Mouse Club. Following his stint on Almost Live!, from 1991 to 1993, he appeared on live-action educational segments of Back to the Future: The Animated Series, assisting Dr. Emmett Brown (played by Christopher Lloyd). Bill Nye the Science Guy, wearing his trademark blue lab coat and bowtie. In 1993, he developed a Bill Nye the Science Guy pilot for public broadcasting station KCTS-TV in Seattle. Nye collaborated with James McKenna, Erren Gottlieb and Elizabeth Brock to plan and create the show for KCTS. The group pitched the show as Mr. Wizard meets Pee-wee's Playhouse. He successfully obtained underwriting from the National Science Foundation and the US Department of Energy. Nye's program became part of a package of syndicated series that local stations could schedule to fulfill Children's Television Act requirements. Because of this, Bill Nye the Science Guy became the first program to run concurrently on public and commercial stations. Bill Nye the Science Guy ran from 1993 to 1998, becoming one of the most-watched educational TV shows in the United States. 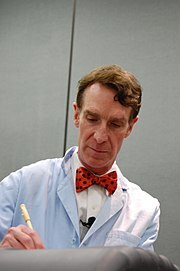 While portraying "The Science Guy", Nye wore a powder blue lab coat and a bow tie. Nye Labs, the production offices and set where the show was shot, was located in a converted clothing warehouse near Seattle's Kingdome. Each episode of the program strived to educate younger viewers on various science concepts, yet it also attracted a significant adult audience as well. The show's ability to make science entertaining and accessible made it a popular teaching tool in classrooms across the country. With its quirky humor and rapid-fire MTV-style pacing, the show won critical acclaim and was nominated for 23 Emmy Awards, winning nineteen. Subsequent research studies found the program to be effective in teaching students science: those that viewed Bill Nye regularly were better able to generate explanations and extensions of scientific ideas than non-viewers. Nye's Science Guy personality is also prominent at Walt Disney Parks and Resorts, most notably his appearance with Ellen DeGeneres at Ellen's Energy Adventure, an attraction which ran from 1996 to 2017 at the Universe of Energy pavilion located inside Epcot at Walt Disney World. His Science Guy persona was also the on-air spokesman for the Noggin television network during 1999. Nye at the March for Science in Washington, D.C. on April 22, 2017. 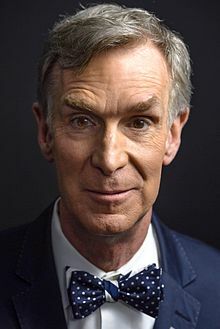 Following the success of Bill Nye the Science Guy, Nye began work on a comeback project, entitled The Eyes of Nye, aimed at an older audience and tackling more controversial science subject matter such as genetically modified food, global warming, and race. However "shifting creative concepts, infighting among executives and disputes over money with Seattle producing station KCTS," significantly delayed production for years. KCTS was hampered by budgetary problems and wasn't able to produce an Eyes of Nye pilot on time. "KCTS went through some distress," Nye recalled. "When we did The Eyes of Nye, the budget started out really big, and by the time we served all these little problems at KCTS, we had a much lower budget for the show than we'd ever had for the 'Science Guy' show which was made several years earlier." PBS declined to distribute Eyes of Nye, though the show was eventually picked up by American Public Television. "PBS wanted more serious, in-depth Nova-style shows," explained co-producer Randy Brinson. The show, which eventually premiered in 2005, lasted for only one season and Nye acknowledged ditching his bow-tie on the program was a mistake. "I tried wearing a straight tie. It was nothing," Nye said. "We were trying something new. It wasn't me." From 2000 to 2002, Nye was the technical expert on BattleBots. In 2004 and 2005, Nye hosted 100 Greatest Discoveries, an award-winning series produced by THINKFilm for The Science Channel and in high definition on the Discovery HD Theater. He was also host of an eight-part Discovery Channel series called Greatest Inventions with Bill Nye. Nye guest-starred in several episodes of the crime drama Numb3rs as an engineering faculty member. A lecture Nye gave on exciting children about math was an inspiration for the creation of the show. He also made guest appearances on the VH1 reality show America's Most Smartest Model. In 2008, he also hosted Stuff Happens, a short-lived show on the Planet Green network. In November 2008, Nye appeared in an acting role as himself in the fifth-season episode "Brain Storm" of Stargate Atlantis alongside fellow television personality and astrophysicist Neil deGrasse Tyson. Nye recorded a short YouTube video (as himself, not his TV persona) advocating clean-energy climate-change legislation on behalf of Al Gore's Repower America campaign in October 2009. Nye joined the American Optometric Association in a multimedia advertising campaign to persuade parents to get their children comprehensive eye examinations. In 2013, Bill Nye guest starred in The Big Bang Theory episode "The Proton Displacement." Sheldon Cooper befriends him and brings him in to teach Leonard Hofstader a "lesson" after Professor Proton (portrayed by Bob Newhart) helps Leonard out with an experiment instead of him. There was a claim by Professor Proton that Bill Nye made his TV series similar to his show. After he and Sheldon leave, Leonard receives a selfie of the two of them having smoothies, and later gets a text from Sheldon asking for a ride home, stating Bill Nye ditched him at the smoothie store. In a later discussion with Professor Proton, Sheldon revealed that Bill Nye had a restraining order against him, so he could not help him contact Nye. On February 28, 2014, Nye was a celebrity guest and interviewer at the White House Student Film Festival. On August 31, 2016, Netflix announced that Nye would appear in a new series titled Bill Nye Saves the World, which premiered on April 21, 2017. 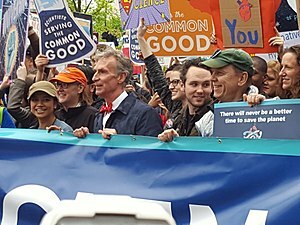 Nye was honorary co-chair of the inaugural March for Science on April 22, 2017. Nye appeared in the 2016 documentary, Food Evolution directed by Academy Award nominated director, Scott Hamilton Kennedy and narrated by Neil deGrasse Tyson. He was the subject of a 2017 biographical documentary film, entitled Bill Nye: Science Guy, directed by David Alvarado and Jason Sussberg. In 2018, Nye guest starred in an episode of Blindspot entitled "Let It Go", playing a fictionalized version of himself who is the father of the character Patterson. His fictional self also alludes to his rivalry with Rodney McKay which was established in the aforementioned episode "Brain Storm" of Stargate Atlantis. In the same year, Nye made a guest appearance on The Big Bang Theory as himself, together with fellow scientist Neil deGrasse Tyson, in the first episode of the show's final season ("The Conjugal Configuration"). In the early 2000s, Nye assisted in the development of a small sundial that was included in the Mars Exploration Rover missions. Known as MarsDial, it included small colored panels to provide a basis for color calibration in addition to helping keep track of time. From 2005 to 2010, Nye was the vice president of the Planetary Society, an organization that advocates space science research and the exploration of other planets, particularly Mars. He became the organization's second Executive Director in September 2010 when Louis Friedman stepped down. The Bill Nye Climate Lab at the Chabot Space & Science Center in 2013. In November 2010, Nye became the face of a major science exhibition at the Chabot Space & Science Center in Oakland, California. Bill Nye's Climate Lab featured Nye as commander of the Clean Energy Space Station and invited visitors on an urgent mission to thwart climate change. Nye with the Chief of Naval Research Rear. Adm. Nevin Carr following the presentation of a "Powered by Naval Research" pocket protector during the Navy Office of General Counsel Spring 2011 Conference. Nye gave a solar noon clock atop Rhodes Hall to Cornell on August 27, 2011, following a public lecture that filled the 715-seat Statler Auditorium. Nye talked about his father's passion for sundials and timekeeping, his time at Cornell, his work on the sundials mounted on the Mars rovers and the story behind the Bill Nye Solar Noon Clock. Nye conducted a Q&A session after the 2012 Mars Rover Landing. From 2001 to 2006, Nye served as Frank H. T. Rhodes Class of '56 University Professor at Cornell University. Nye is a fellow of the Committee for Skeptical Inquiry, a U.S. non-profit scientific and educational organization whose aim is to promote scientific inquiry, critical investigation, and the use of reason in examining controversial and extraordinary claims. Interviewed by John Rael for the Independent Investigation Group IIG, Nye stated that his "concern right now ... scientific illiteracy ... you [the public] don't have enough rudimentary knowledge of the universe to evaluate claims." In November 2012, Nye launched a Kickstarter project for an educational Aerodynamics game called AERO 3D but it was not funded. 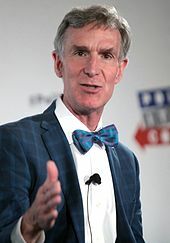 In September 2012, Nye claimed that creationist views threaten science education and innovation in the United States. In February 2014, Nye debated creationist Ken Ham at the Creation Museum on the topic of whether creation is a viable model of origins in today's modern, scientific era. In July 2016, Ham gave Nye a tour of the Ark Encounter the day after it first opened to the public. He and Ham had an informal debate while touring the structure, and footage from Nye's visit was subsequently included in the documentary film Bill Nye: Science Guy, which was released in 2017. Since 2013, Nye has been listed on the Advisory Council of the National Center for Science Education. On Earth Day 2015, Nye met with U.S. President Obama to visit the Everglades National Park in Florida and discuss climate change as well as science education. In March 2015, Nye announced he changed his mind and now supports GMOs. In a new edition of Undeniable: Evolution and the Science of Creation, Nye rewrote a chapter on GMOs reflecting his new position. In a radio interview with Neil deGrasse Tyson, Nye stated "there's no difference between allergies among GMO eaters and non-GMO eaters...I've changed my mind about genetically modified organisms". In July 2017, Nye observed that the majority of climate change deniers are older people, and stated, "so we're just going to have to wait for those people to 'age out', as they say". Nye has written three books, including Undeniable: Evolution and the Science of Creation, Unstoppable: Harnessing Science to Change the World, and Everything All at Once: How to Unleash Your Inner Nerd, Tap into Radical Curiosity and Solve Any Problem. Nye holds three United States patents, including one for ballet pointe shoes, one for an educational magnifying glass created by filling a clear plastic bag with water. and one for a device for training an athlete to throw a ball. He also holds a design patent for a digital abacus. Nye was a contestant in the season 17 of Dancing with the Stars in 2013, partnered with new professional dancer Tyne Stecklein. They were eliminated early in the season after Nye sustained an injury to his quadriceps tendon on Week 3. Nye with Barack Obama and Neil deGrasse Tyson taking a selfie in 2014. Nye has several residences, living both in the Studio City neighborhood of Los Angeles and New York City. In addition, he owns a house on Mercer Island near Seattle. Nye has solar photovoltaic panels on his California house and his electricity meter often runs in reverse, which he has shown off to visitors. Nye and his neighbor, environmental activist/actor Ed Begley, Jr., have engaged in a friendly competition "to see who could have the lowest carbon footprint", according to Begley. Nye often appeared on Begley's HGTV/Planet Green reality show Living with Ed. In July 2012, Nye supported President Barack Obama's reelection bid. 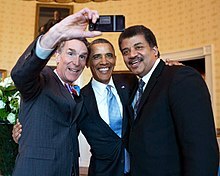 Nye frequently consulted with Obama on science matters during his presidency, and famously took a selfie with him and Neil deGrasse Tyson at the White House. Nye attended the 2018 State of the Union Address after being invited by Oklahoma Congressman Jim Bridenstine. Nye's attendance drew scrutiny due to Bridestine's "history of expressing climate change skepticism," but Nye defended the move. "While the Congressman and I disagree on a great many issues -- we share a deep respect for NASA and its achievements and a strong interest in the future of space exploration. My attendance tomorrow should not be interpreted as an endorsement of this administration, or of Congressman Bridenstine's nomination, or seen as an acceptance of the recent attacks on science and the scientific community," Nye said. Nye married musician Blair Tindall, on February 3, 2006; however, he annulled the relationship seven weeks later when the marriage license was declared invalid. In 2007, Nye obtained a protective order against Tindall after she broke into his house, stole several items, including his laptop which she used to send defamatory emails impersonating him and damaged his garden with herbicide. Tindall acknowledged killing his plants but denied being a threat to him. Subsequently, Nye sued Tindall for $57,000 in attorney's fees after she allegedly violated the protective order. In the 2017 PBS documentary Bill Nye: Science Guy, Nye revealed his family's plight of ataxia. Due to his father's, sister's and brother's lifelong struggles with balance and coordination, Nye decided to not have children himself, so as to avoid the chance of passing on the genetic condition to them, even though he "dodged the genetic bullet" himself. In July 2018, Nye played for the National League squad during the MLB All-Star Legends and Celebrity Softball Game. Despite striking out in his first at-bat, Nye singled in the bottom of the third inning to a rousing ovation from the Nationals Park crowd. In March 2019, Nye asked Alexandria Ocasio-Cortez a question during her interview at the South by Southwest Festival about political fear and climate change. Nye and Ocasio-Cortez later posed for a selfie in support of the Green New Deal which Nye uploaded to his twitter account. Nye has state that he is a member of two trade unions. In May 1999, Nye was the commencement speaker at Rensselaer Polytechnic Institute where he was awarded an honorary doctor of science degree. He was awarded an honorary doctorate by Johns Hopkins University in May 2008. In May 2011, Nye received an honorary doctor of science degree from Willamette University In May 2015, Rutgers University awarded him an honorary doctor of science degree and paid him a $35,000 speaker's fee for his participation as the keynote speaker at the ceremony. In addition, Nye also received an honorary doctor of pedagogy degree from Lehigh University on May 20, 2013, at the commencement ceremony. Nye received the 2010 Humanist of the Year Award from the American Humanist Association. In October 2015, Nye was awarded an honorary doctorate of science from Simon Fraser University. In 2011, the Committee for Skeptical Inquiry (CSICOP) presented Nye their highest award In Praise of Reason, Eugenie Scott stated: "If you think Bill is popular among skeptics, you should attend a science teacher conference where he is speaking" it is standing room only. She continues by saying that no one has more fun than Nye when he is "demonstrating, principles of science." In 1997, CSICOP also presented Nye with the Candle in the Dark Award for his "lively, creative... endeavor". Nye, Bill (2014). Powell, Corey S., ed. Undeniable: Evolution and the Science of Creation. St. Martin's Press. ISBN 9781250007131. Nye, Bill (2015). Powell, Corey S., ed. Unstoppable: Harnessing Science to Change the World. St. Martin's Press. ISBN 9781250007148. Nye, Bill (2017). Powell, Corey S., ed. Everything All at Once: How to Unleash Your Inner Nerd, Tap Into Radical Curiosity, and Solve Any Problem. St. Martin's Press. ISBN 9781623367916. Time magazine has interviewed him for "12 Questions with Bill Nye". ^ a b c Webster, Andy (October 26, 2017). "Review: 'Bill Nye: Science Guy,' a Portrait of a Fighter for Facts". The New York Times. Retrieved October 30, 2017. ^ "Bill Nye, engineer/television genius". Public Broadcasting Service. Retrieved April 22, 2016. ^ Rutgers. "2015 Commencement Speaker: William Sanford Nye". Rutgers.edu. Rutgers. Archived from the original on May 6, 2015. Retrieved May 4, 2015. ^ Goldberg, Carey (April 9, 1997). "Pondering Fire, Infinity and a Head of Lettuce (Cool!)". The New York Times. Retrieved April 27, 2017. ^ a b Wilensky, Joe (August 29, 2011). "Cornell Chronicle: Bill Nye '77 dedicates Solar Noon Clock". News.cornell.edu. Retrieved July 11, 2012. ^ "The March for Science was a moment made for Bill Nye". The Washington Post. April 23, 2017. Retrieved April 27, 2017. ^ a b Schwartz, John (June 17, 2013). "Firebrand for Science, and Big Man on Campus". The New York Times. Retrieved June 18, 2013. ^ "Bill Nye". Contemporary Theatre, Film and Television. Volume 64. September 1, 2005. Gale. Retrieved November 4, 2011. ^ a b "What My Father Taught Me: Bill Nye". Popular Mechanics. May 30, 2013. Retrieved March 11, 2018. ^ "Biography | Bill Nye the Science Guy". Billnye.com. Archived from the original on February 2, 2010. Retrieved March 24, 2011. ^ "Transcript of Oral History of Jenkins, S.S. (Bud)". Library.uncw.edu. October 8, 2003. Retrieved March 24, 2011. ^ "Jacqueline Jenkins-Nye, 79, World War II code breaker". Baltimore Sun. April 3, 2000. Retrieved March 24, 2011. ^ Leal, Samantha (July 28, 2015). "Talk About Badass: Bill Nye's Mom Was a Code Breaker During WWII". Marie Claire. Retrieved April 27, 2017. ^ "Bill Nye is from the District — but devoted to the other Washington's football team". Washington Post. May 5, 2017. Retrieved March 11, 2018. ^ Nye, Bill (January 21, 2009). "My School Days – The Crazy Luck". The Huffington Post. Retrieved June 30, 2009. ^ a b "Janet Reno and Bill Nye appointed CU Rhodes Class of '56 Professors". Cornell Chronicle. Cornell University. June 19, 2001. Retrieved January 17, 2014. ^ Priest, Susanna Hornig (2010). "Nye, Bill (1955–)". Encyclopedia of Science and Technology Communication. SAGE Publications. p. 533. Retrieved April 23, 2017. ^ Freeman, David (December 18, 2015). "Maybe This Is Why Bill Nye Never Became An Astronaut". HuffPost. Retrieved March 14, 2018. ^ a b c "An Oral History of 'Almost Live'". Seattle Metropolitan. May 17, 2013. Retrieved April 23, 2017. ^ a b c Kessler, Sarah (October 1, 2012). "How Bill Nye Became The Science Guy. And A Ballet Shoe Inventor. And a Political Voice". Fast Company. Retrieved April 23, 2017. ^ a b "Bill Nye Is Still the Nuttiest Professor". Seattle Metropolitan. September 3, 2013. Retrieved April 23, 2017. ^ a b c "Bill Nye is back and trying to save the world in new Netflix series". Seattle Times. April 19, 2017. Retrieved May 7, 2017. ^ Bradley, Ryan (August 21, 2014). "Bill Nye Fights Back". Popular Science. Retrieved March 11, 2018. ^ "Bill Nye the Science Guy Interview". Retrieved March 15, 2014. ^ "Almost Live! : What Seattle Sketch Comedy Gave to Us". Splitsider. September 27, 2011. Retrieved April 23, 2017. ^ a b Boss, Kit (October 4, 1989). "ON SEATTLE TV, IT'S A COMIC, IT'S AN ENGINEER_IT'S SCIENCE GUY!". Washington Post. Retrieved March 11, 2018. ^ a b c "BILL NYE'S EARLY LIFE AND CAREER 1955-1992". Seattle Television History. University of Washington. Retrieved May 9, 2017. ^ "Netflix Orders Bill Nye Talk Show". Hollywood Reporter. August 31, 2016. Retrieved March 11, 2018. ^ "HISTORICAL BACKGROUND FOR KCTS". Seattle Television History. University of Washington. Retrieved April 23, 2017. ^ a b Chotkowski LaFollette, Marcel (2012). Science on American Television: A History. University of Chicago Press. ^ a b c Boss, Kit (December 18, 1994). "The Bill Nye Effect". The Seattle Times. ^ A Study of Bill Nye The Science Guy:Outreach and Image (PDF). p. 10. Archived from the original (PDF) on February 22, 2014. Retrieved November 23, 2012. ^ Bell, Phillip (2009). Learning Science in Informal Environments: People, Places, and Pursuits. National Academies Press. p. 253. Retrieved May 9, 2017. ^ "Slapstick Science". Popular Science. May 1997. Retrieved March 14, 2018. ^ a b "Bill Nye comeback: hope and dismay in Seattle". Current.org. May 13, 2003. Retrieved May 7, 2017. ^ "That Science Guy is back, in 'Eyes of Nye'" (PDF). Seattle Post-Intelligencer. April 4, 2005. Archived (PDF) from the original on May 23, 2016. Retrieved May 9, 2017. ^ "HAPPY BIRTHDAY, BILL NYE!". Wired. November 27, 2011. Retrieved March 15, 2018. ^ "Greatest Discoveries". The Science Channel. Retrieved March 15, 2018. ^ "The Numb3rs Guy". Time. December 4, 2005. Retrieved September 2, 2014. ^ "The Weather Channel Will Deepen Commitment to Forecast Earth and Related Content on All Platforms". Business Wire. January 7, 2008. Retrieved March 17, 2018. ^ Bubbeo, Daniel (April 11, 2017). "Bill Nye's new lab-centric talk show has nice chemistry". Newsday. Retrieved March 17, 2018. ^ Priest, Susanna Hornig (2010). "Nye, Bill (1955–)". Encyclopedia of Science and Technology Communication. SAGE Publications. p. 534. Retrieved April 23, 2017. ^ Woerner, Meredith (August 15, 2008). "First Pics Of Jewel Staite's Hot Date On Atlantis". io9. Retrieved June 30, 2009. ^ "Repower America – Bill Nye, The Science Guy". YouTube. Retrieved March 24, 2011. ^ "Make Eye Exams Part of the Back to School Routine". YouTube. Retrieved March 24, 2011. ^ "Bob Newhart and Bill Nye to guest star on 'Big Bang Theory'". TODAY. October 2, 2013. Retrieved March 17, 2018. ^ Chan, Anna. "Bob Newhart and Bill Nye to guest star on 'Big Bang Theory'". ^ "Students Are Stars at White House Film Festival". NBC News. Retrieved March 26, 2015. ^ McFarland, K.M. (August 31, 2016). "Bill Nye Is Getting His Own Talk Show on Netflix". Wired. Retrieved September 1, 2016. ^ Schwartz, Ryan; Schwartz, Ryan (February 8, 2017). "Bill Nye Saves the World Gets Netflix Premiere Date, Star-Studded Trailer". TVLine. Retrieved February 8, 2017. ^ Sarah Kaplan, "Bill Nye Will Join the March for Science", The Washington Post (March 30, 2017). ^ DeFore, John (December 1, 2016). "'Food Evolution': Film Review". The Hollywood Reporter. Retrieved July 31, 2018. ^ Abrams, Natalie (May 4, 2018). "'Blindspot': Patterson's name revealed — sort of!". EW.com. Retrieved May 5, 2018. ^ Love, Rachel Caris (May 4, 2018). "Let It Go". Blindspot. Season 3. Episode 20. 20 minutes in. NBC. OK, your mother is going to publish a paper with none other than Dr. Rodney McKay! He's my academic rival! ^ Hein, Michael (September 24, 2018). "'Big Bang Theory' Welcomes Bill Nye, Neil deGrasse Tyson in Season Premiere". Popculture. Retrieved October 16, 2018. ^ Friend, T. (January 5, 2004). The sun on Mars. In The talk of the town. The New Yorker, LXXIX, 27. ^ a b Rahner, Mark (April 26, 2005). "Eye to eye with Bill Nye the Science Guy". The Seattle Times. Retrieved June 30, 2009. ^ "Bill Nye Signs on as Planetary Society's New Executive Director" (Press release). The Planetary Society. June 7, 2010. Archived from the original on November 28, 2010. Retrieved December 6, 2010. ^ "Bill Nye Biography". The Planetary Society. Retrieved December 6, 2010. ^ "What's Up at Chabot: Bill Nye's Climate Lab opens at Chabot". The Mercury News. November 11, 2010. Retrieved March 15, 2018. ^ "Bill Nye's Climate Lab at Chabot Space & Science Center". Video. YouTube. Archived from the original on December 29, 2013. Retrieved April 21, 2011. ^ Bardin, Jon; Soon-Shiong, Nika (August 5, 2012). "Mars rover Q&A with Bill Nye the Science Guy". Los Angeles Times. ^ "Walk among the planets with a star: Bill Nye, the Science Guy, guides a tour of Ithaca's Sagan Planet Walk on March 7" (PDF). Chronicle Online. Cornell University. March 1, 2006. Retrieved June 30, 2009. ^ "CSI Fellows and Staff." The Committee for Skeptical Inquiry. Retrieved January 4, 2010. ^ Bill Nye interview (part 2 of 2) on YouTube (Be Skeptical episode 3) IIG West. Retrieved July 26, 2011. ^ "AERO 3D Bird Flight Game with Bill Nye and GameDesk". Kickstarter.com. November 28, 2012. Retrieved October 1, 2013. ^ Luvan, Dylan (September 24, 2012). "Bill Nye Warns: Creation Views Threaten U.S. Science". Associated Press. Retrieved September 24, 2012. ^ Fowler, Jonathan; Rodd, Elizabeth (August 23, 2012). "Bill Nye: Creationism Is Not Appropriate for Children". YouTube. Retrieved September 24, 2012. ^ Lily Kuo (August 28, 2012). "Bill Nye the Science Guy says creationism not good for kids". Toronto Sun. Reuters. Retrieved October 22, 2012. ^ Boyle, Alan (February 5, 2014). "Bill Nye Wins Over the Science Crowd at Evolution Debate". NBC News. Retrieved February 6, 2014. ^ Kopplin, Zack (February 4, 2014). "Why Bill Nye the Science Guy is trying to reason with America's creationists". The Guardian. London. Retrieved February 6, 2014. ^ Nye, Bill; Ham, Ken (February 4, 2014). "Bill Nye Debates Ken Ham (video - 165:32)". YouTube. Retrieved February 5, 2014. ^ Ham, Ken (July 8, 2016). "Bill Nye Visits the Ark Encounter". Answers in Genesis. Retrieved July 16, 2016. ^ Contrera, Jessica (July 10, 2016). "Bill Nye Visited a Noah's Ark He Doesn't Believe Should Exist". The Washington Post. Retrieved July 11, 2016. ^ Nye, Bill & Ham, Ken (March 13, 2017). "Nye/Ham: The Second Debate Premiere (video - 117:04)". YouTube. ^ Addiego, Walter (November 17, 2017). "The evolution of the science guy". The San Francisco Chronicle. ^ "Advisory Council". ncse.com. National Center for Science Education. Archived from the original on August 10, 2013. Retrieved October 30, 2018. ^ Mooney, Chris (April 24, 2015). "Bill Nye: Climate change is "not something you should be debating or denying"". Washington Post. Retrieved May 5, 2015. ^ Holst, Lindsay (April 22, 2015). "Follow Along: Earth Day 2015". The White House. Retrieved May 5, 2015. ^ "Bill Nye on Twitter". Twitter. April 21, 2015. Retrieved May 5, 2015. ^ Kollipara, Puneet (March 15, 2013). "Proof he's the Science Guy: Bill Nye is changing his mind about GMOs". Washington Post. Retrieved March 17, 2018. ^ "Proof he's the Science Guy: Bill Nye is changing his mind about GMOs". March 3, 2015. Retrieved February 3, 2016. ^ "Why Did Bill Nye Change His Mind about GMOs?". November 25, 2015. Retrieved February 3, 2016. ^ Morrison, Patt. "Bill Nye on the terrifying ascendancy of American 'dingbatitude'" – via LA Times. ^ Deiviscio, Jeffrey (November 3, 2014). "A Fight for the Young Creationist Mind - In 'Undeniable', Bill Nye Speaks Evolution Directly to Creationists". The New York Times. Retrieved November 4, 2014. ^ "William S. Nye". Google Patent search. Retrieved October 21, 2012. ^ Kloeppel, James (February 7, 2002). "Bill Nye the Science Guy among attractions at Engineering Open House March 8, 9". News Bureau. University of Illinois at Urbana–Champaign. Retrieved March 14, 2018. ^ Shira, Dahvi (September 23, 2016). "Dancing with the Stars Sends Bill Nye Home". People. Retrieved May 13, 2017. ^ "Where the Science Guy Loosens His Tie". The New York Times. April 3, 2015. Retrieved April 4, 2015. ^ Nye, Bill (1993). Bill Nye The Science Guy's Big Blast Of Science. Basic Books. ISBN 978-0201608649. ^ Jefferson, Whitney (January 11, 2011). "Take a Tour of Bill Nye's House". Gawker. Retrieved March 10, 2018. ^ Kerley, David (July 25, 2007). "Eco-Friendly Competition: Who Can Go Greener?". ABC News. Retrieved June 30, 2009. ^ Lewine, Edward (April 20, 2008). "Greener Pastures". The New York Times. Archived from the original on February 19, 2012. Retrieved April 28, 2008. ^ "Bill Nye's guy: Popular TV show scientist throws support behind President Obama". Fosters.com. July 19, 2012. Retrieved October 22, 2012. ^ "That time I took a selfie with Neil Tyson and the President of the United States". The Planetary Society. April 7, 2014. Retrieved March 11, 2018. ^ "Bill Nye defends plan to see State of the Union with Trump's NASA nominee". CNN. January 30, 2018. Retrieved March 10, 2018. ^ "Bill Nye's Withered Romance". CBS News. February 11, 2009. Retrieved May 19, 2012. ^ ""The Science Guy" Wants to Send "Wife" to the Moon". TMZ.com. Retrieved March 26, 2015. ^ "Bill Nye the Science Guy -- Locked in $57,000 Battle with Stalker Ex-Girlfriend". TMZ.com. Retrieved March 26, 2015. ^ "Documentary reveals how a troubled Bill Nye tries to save the world". ^ "Bill Nye surprises Alexandria Ocasio-Cortez at South by Southwest festival". CBS News. ^ "Bill Nye comes out in support of Green New Deal: Ocasio-Cortez 'gets it'". The Hill. ^ "Bill Nye Surprised AOC at SXSW to Talk About Climate Change". Vice News. ^ Karen W. Arenson (May 31, 1999). "Recognizing Achievement, Adding Glitz". The New York Times. Retrieved December 31, 2014. ^ "Hats Off to New Grads". The JHU Gazette. May 27, 2008. Retrieved March 15, 2018. ^ "Willamette University announces commencement speakers and honorary degree recipients" (Press release). Willamette University. March 9, 2011. Archived from the original on March 12, 2011. Retrieved December 31, 2014. ^ Clark, Adam (May 18, 2015). "Bill Nye tells Rutgers grads to 'change the world' at 2015 commencement". NJ.com. New Jersey On-Line LLC. Retrieved May 22, 2015. Nye received an honorary Doctor of Science degree, and the school paid him a $35,000 speaking fee. ^ Linda Harbrecht (April 5, 2013). "Bill Nye "The Science Guy" to deliver commencement address". Lehigh University. Retrieved December 31, 2014. ^ "Humanists hold 69th annual conference San Jose, California". Website AHA. American Humanist Association. June 3, 2010. Retrieved December 31, 2014. ^ "Bill Nye Receives Honorary Degree From SFU". Simon Fraser University. October 8, 2015. Retrieved March 13, 2016. ^ "Bill Nye Wins In Praise of Reason Award". Skeptical Inquirer. CSICOP. Retrieved August 19, 2016. "Bill Nye, one of my favorite shows". Archive. Love Line. March 25, 2003. Archived from the original (podcast) on 2006. Zepps, Josh; Beyerstein, Lindsay (April 21, 2006). "Changing The World With Science Education" (podcast). Interview. Point of Inquiry. Rahner, Mark (April 26, 2005). "Eye to eye with Bill Nye the Science Guy". The Seattle Times. "100 Greatest Discoveries" (video clips). Discovery: Science Channel.